Libraries – Do You Use Them? Today is PLR day. A terribly exciting day for authors everywhere, as we find out how much PLR we’ve earned. PLR (public lending rights) is the money an author gets whenever you take one of their books out of the library. It’s a few pence for each borrow, but obviously if you’ve got a lot of books out there, and a lot of people borrowing them, it can add up and you get a nice income boost to brighten up gloomy January. It was my first PLR day after the release of Baby Badger’s Wonderful Night last spring, and I made the princely sum of £13.65. Oh yes. And that’s BEFORE tax, people. I’m rich! Or, er, not. But anyway, I posted about this on my Facebook page and it started an interesting debate about libraries, and whether or not they’re still relevant – and even used – anymore. I love libraries. Mainly because I love books. Especially FREE books. But I probably don’t use my local library as much as I should, although I plan to now, as Tornado Toddler adores reading, and the library will offer him a lot of reading material, and cost me nowt. I’ve visited sporadically over the past year, doing the singing events when Tornado Toddler was a baby and borrowing the odd book here and there. I’m trying to cut down on the amount of stuff in my house, so am borrowing the books I’ll only read once, rather than buying them. But still, I don’t go as much as I once did. And with the increasing popularity of Kindles, and nobody really needing reference books anymore what with Google right at our finger tips, I can see why people think libraries aren’t really needed. I think libraries still have a lot to offer the community, and I’d be really sad to see mine go. Why not pay your local library a visit this week – you might be surprised by what you find. What about you – do you use yours? I resisted reading The Hunger Games for a long time, so I know I’m coming to this super late, but wow, this book is amazing. I don’t get a lot of reading time at the moment (being a mother to a tornado toddler) but I’ve devoured the first two in this YA trilogy in record time and am currently finishing the third. 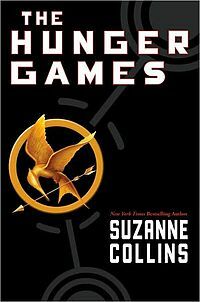 Katniss is sixteen and lives with her mother and sister in one of the poorest districts of what used to be the United States. Each district must send one boy and one girl as a tribute to take part in the annual Hunger Games, a televised reality show where the last one left standing (i.e. alive) is the winner. When Katniss’s sister is chosen as tribute, Katniss volunteers to take her place. It’s the ultimate story of survival and had me on the edge of my seat, desperate to know who came out alive. I can’t wait for the film later this year. I just hope they do it justice – I hate it when you’re passionate about a book and then the film lets it down.